Here’s Amy. Hello! Amy and I work for the same Housing Association. 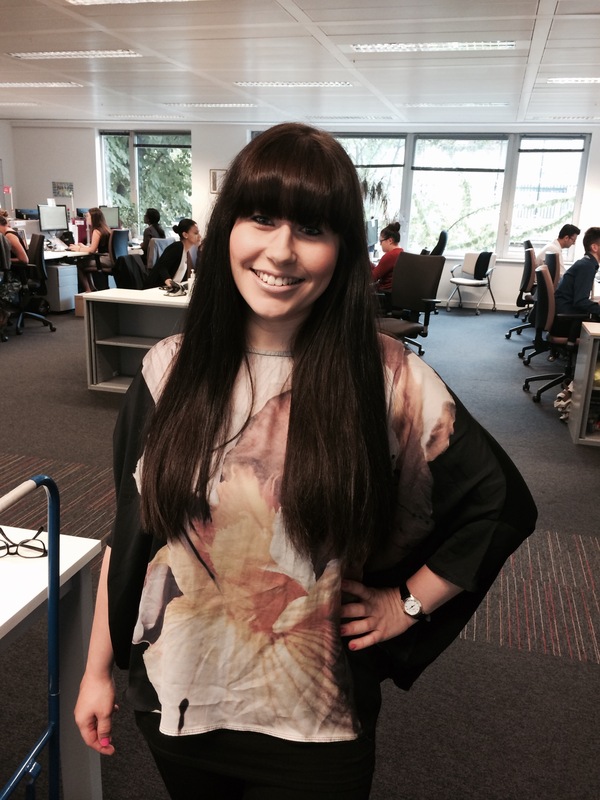 She is in the Communications team and she does lots of things, but once or twice a year she becomes a Party Organiser. Notting Hill Housing is an amazing organisation. It’s primary role is to provide affordable homes for low-income Londoners, a really important job that gets ever more challenging with the average home in London now costing around £500,000. We still rent out homes in Notting Hill for less than £100 a week, and sell shared ownership homes for couples earning around £40,000 a year between them. But it is also an organisation that understands all its successes are down to the sterling efforts of its staff. As we build and manage more homes, and make more money to support our social purpose, we need to sometimes spend a little time celebrating together. Every year we, or Amy, Nick Mawley and Johannah to be precise, organise a summer party. The sun always shines, there is plenty to eat and drink, Micah Watkis (Housing Officer extraordinaire) is the DJ and our communications team put on wonderful “themed” events. Last year the theme was the 60s – because we were celebrating our 50th anniversary. Many staff members dressed up in genuine vintage numbers, some bought outrageous eBay outfits, and I wore my 1964 YSL Mondrian dress. This year the theme is “International” – partly to celebrate our diverse staff and customer group – but also as it offers lots of possibilities with the theme. International music, food, games and outfits. Notting Hill staff love fancy dress parties. Over coffee and at the tea-points, at lunch time and on the way to the tube they ask each other “what will you be wearing?”. I started with a clear idea. I bought a few pieces of African fabric at Brixton market, and I planned to remake last year’s dress, but to use African fabrics for the colour blocks instead. I would have used that red on the right, the navy with yellow for the blue, and the yellow and turquoise for the yellow. I would have done it. I may do it. But right now I can’t find the pattern. I am going to have to move to digital patterns soon, mainly due to the storage problem I have with lots of bits of paper in a small flat. In fact today I am going to sign up for a Burda course which I hope to do with my friend Suzie Kemner of DesignOmatic, but I am having problems with the site at present. I will let you know how I get on. Here’s another idea. When I was developing the Mondrian dress I made a toile. Well I made several, truth be told, but this is one of them (not pressed, and not finished). I was trying very hard to produce a dress where all the shaping went into the seams and I achieved it with this dress, made with my own dress block rather than based on the YSL one (it’s such a long story). This dress fits pretty well and could be completed with say some African fabric sleeves, or I could use the patterned fabric for the hem section instead of the white. I could simply produce some bias binding and finish it at the neck, arm holes and hem with a bit of colour. Or I could do something completely different. I have quite a lot of cloth. And my deadline is Friday 15 August. What do you think? I saw someone on the tube wearing a nice long skirt in ethnic fabric. Ideal for this weather. What about a mix and match effect, using a range of fabrics? Another alternative would be just to wear a head wrap with something more British and ordinary? 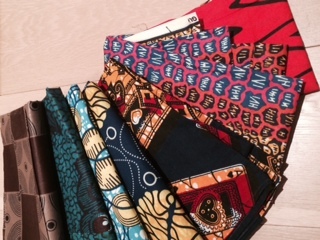 Or maybe make something more African in its shape – like a tailored jacket with a long skirt? A relaxed over shirt to go with jeans? A maxi dress (many of these African patterns are quite large-scaled – one yard = one and a half peacocks)? Trousers? 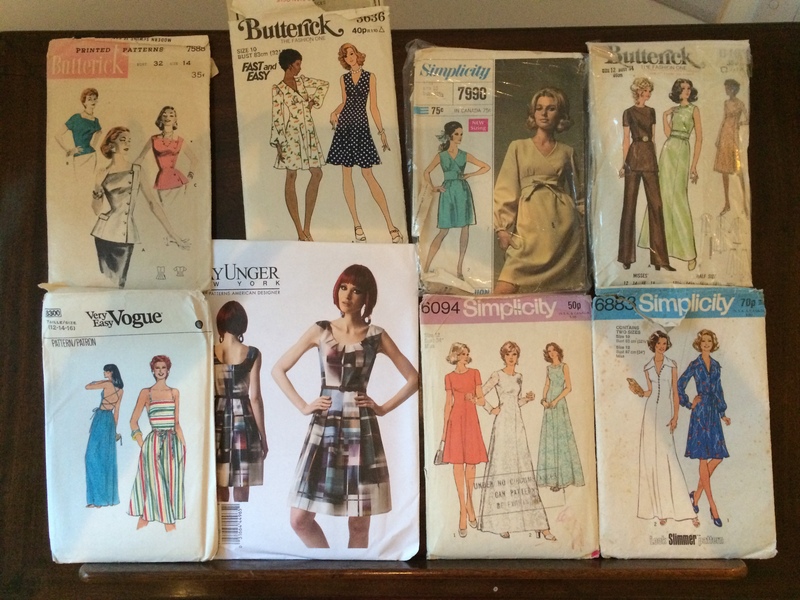 Here are some patterns I already have, but I could manage a simple new pattern in the time. There are too many possibilities here, but I would welcome any feedback or suggestions you may have. Whatever I make, I will be using my beautiful new shears. 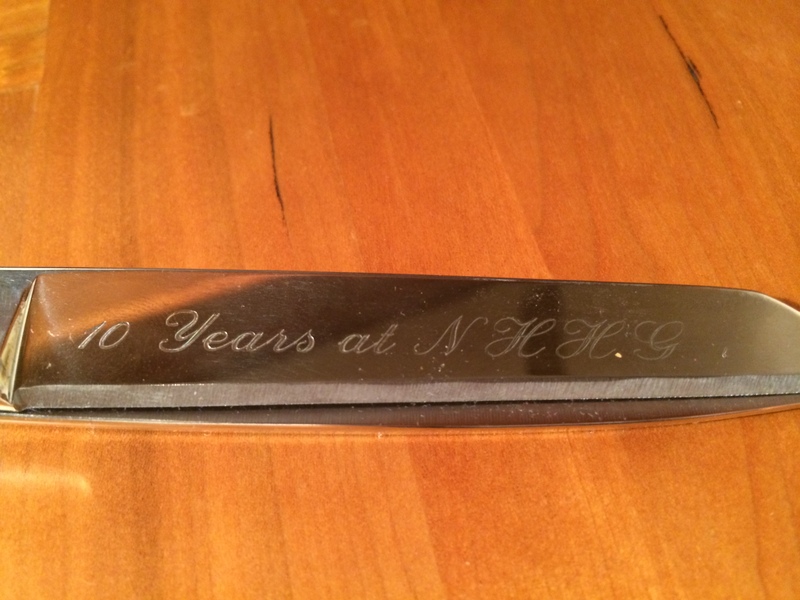 In June I celebrated 10 years at the Notting Hill Housing Group, and my colleagues very kindly gave me just what I wanted – a new very fine pair of engraved tailoring shears. I said it was a nice company with great people – what a thoughtful present for a keen dressmaker. Thanks Galina for bringing those amazing Japanese fabrics to my attention. Aren’t they gorgeous? Yes, a real feast for the eyes! I’m certain whatever you decide will have that wow factor that distinguishes your creations… your YSL inspired dress is just fabulous! I just love a theme party! What fun…….. I like the Vogue pattern. very summery and would lent itself nicely to prints….. pants and tunic would be great tooo…oh decisions decisions……. what ever you choose will be fabulous. Love love love the dress you made and wore last year. Looking forward to hearing your decision. Parties are a chance to …well, live it up…don’t hold back —— its a Party :~ ) wow, those engraved scissors are precious! This looks like fun. I’ve seen a few blog makes using map printed fabric, that could work in a simple style but it would prolly not be a durable as your YSL and you wouldn’t want to pay over much for it. I’ve also seen London Underground fabric and that image is known internationally. Alternatively you could make a bag out of a themed fabric. Love your mondrial dress, I like colour blocking a lot. All lovely options. I like your toile and that would definitely work with a band in the African print fabric. For some reason, I see a dramatic skirt in one of those prints. Whatever you decide, I’m sure the finished product will be accomplished, as is your Mondrian dress. 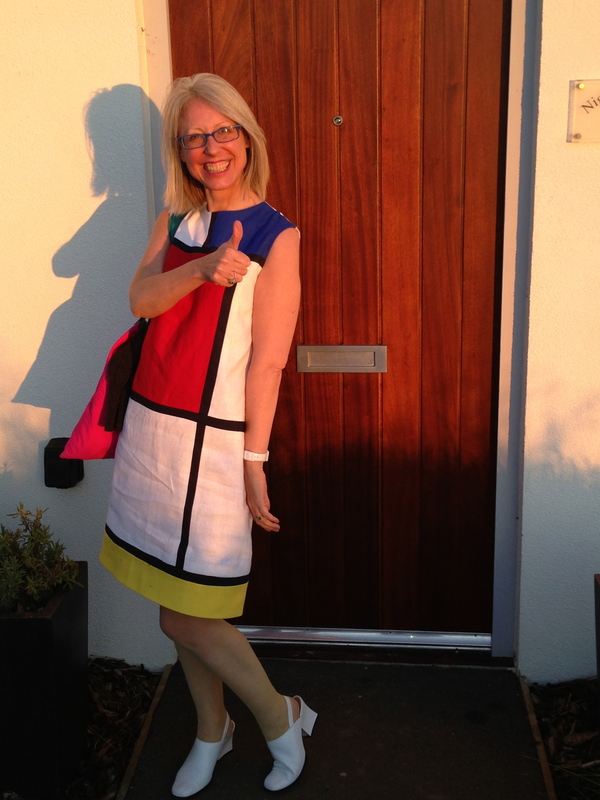 Your Mondrian dress is fabulous… on it’s own & on you. I don’t sew… and your website is wonderful. Forgive me, I noticed the crease at the seat of your dress… and can’t help but post a thought. I read that cloth cut on the bias is less likely to crease at the seat. So, I bought a linen dress that had been cut on the bias to wear on a hot, muggy day…. where I would be sitting for an hour. The result… no crease at the seat & no stretch at backside. Bonus: the bias cut draped beautifully… erasing every lump & bump of my figure.